Saturday August 19th 1883 It was a very warm day. I was busy about the house all the forenoon and was asleep in the afternoon. I wrote a letter to Anna Offett in the evening. 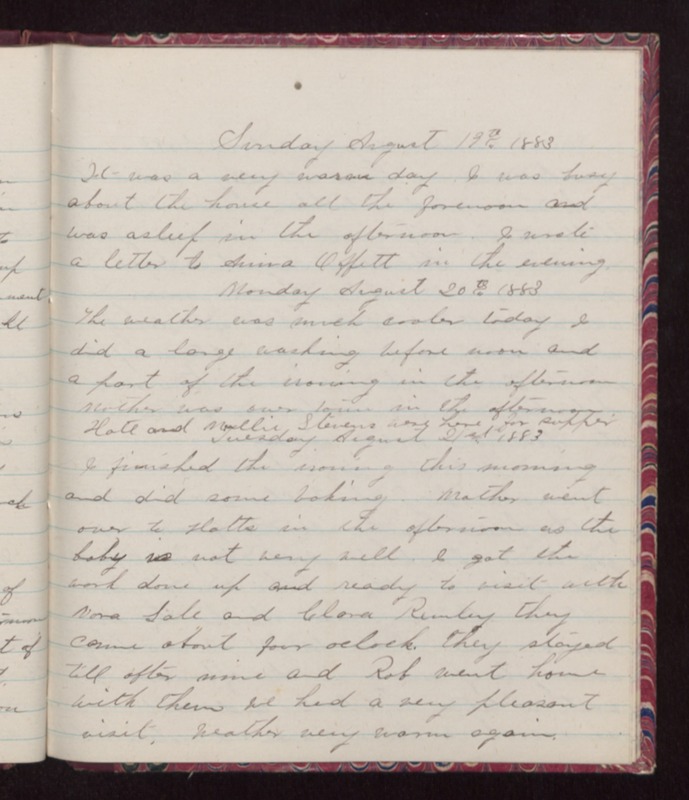 Monday August 20th 1883 The weather was much cooler today I did a large washing before noon and a part of the ironing in the afternoon Mother was over town in the afternoon. Hatt and Mollie Stevens were here for supper. Tuesday August 21st 1883 I finished the ironing this morning and did some baking. Mother went over to Hatts in the afternoon as the baby is not very well. I got the work done up and ready to visit with Nora Sale and Clara Rumley they came about four oclock. They stayed till after nine and Rob went home with them we had a very pleasant visit. Weather very warm again.